This tiny little antelope takes the prize for being the smallest antelope in South Africa. With front feet looking almost too short for those at the back, the big head and big eyes, it's eyesight and especially it's nose serves as the only defense in the big and dangerous bush. Small wonder that the blue duiker is extra careful and nervously shy before it moves out in open spaces. The blue duiker is a mix of dark brown and grey in colour, and when seen from behind, gives a blue shine effect which has earn him his name. It gives a moisture with a distinct scent from glands in his face and hooves which presumably each having its own function in territorial and mating instincts. The blue duiker's nerve is tested almost all day long, but, although its tiny little tail will be wagging, he have survived in spite of his incredibly tiny measurements. 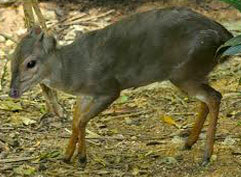 Numbers of the blue duiker aren't abundantly, however.